How High is Your Combined Tax Rate? The Governor of Texas has recently appeared in local ads touting the state’s low tax rates. Just how much lower than Maryland are the Texas rates? 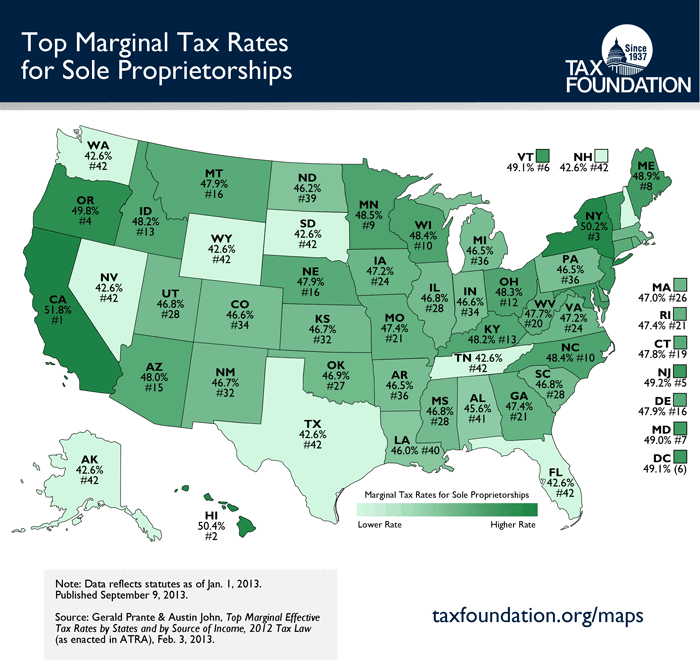 The Tax Foundation has recently published a chart showing the top marginal individual tax rates for sole-proprietors in the 50 states and the District of Columbia. These rates reflect the sum of federal, state and local income taxes, self employment taxes and are adjusted for the state and local tax deduction. The top three combined tax rate states are California (51.8%), Hawaii (50.4%) and New York (50.2%). Maryland is the seventh highest state at a 49% combined rate. Texas is tied for the lowest rate (42.6%) with the other states that do not tax individual income. Your rate could be higher than these percentages if you are subject to the alternative minimum tax. Bottom line is the government takes about half of your income in taxes. As tax professionals, we are frequently asked by our clients “How can we pay less taxes.” The short answer is planning. There are many proven methods of reducing tax obligations including deferring income, accelerating deductions, shifting profits to lower tax rate jurisdictions, taking advantage of state tax incentives, avoiding state tax audit adjustments, and many other techniques which can lower the bottom line on your tax return.